When I mentioned my retirement in the “About” section of this Blog, it wasn’t the complete story. While I retired from my substantive position some time ago, I still work about half a day a week from home for a Tribunal where I interact with lawyers. This explains why I sometimes use odd words like “substantive” in an otherwise normal sentence. The job involves regular telephone link-ups with other Tribunal members around Australia, but once a year we have a conference at some gorgeous location where we spend two days, among work duties, catching up with each other in person. And during our downtime, we had the choice of an invigorating walk up to the aforementioned breathtaking views, an invigorating round of golf, or a game of Petanque. Now I had no idea what Petanque was, but as it didn’t have the word ‘invigorating’ before it, it sounded like the activity for me. Alas, I had a hard time convincing anyone else to join me in a mystery game. I hadn’t realised that persuading others – especially those who are not retired – to find fun and frivolous things to do might take some effort on my part. But bless Lancemore Hill. It turned out that the activity was actually called Pinot and Petanque and as they delivered the Petanque equipment to me, it was accompanied by a bottle of Pinot and four glasses. Suddenly, I had too many playmates for Petanque. 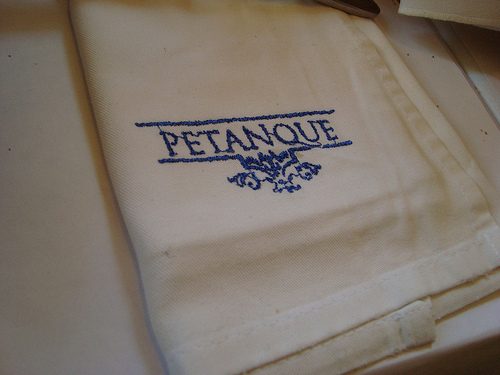 So what is Petanque, you ask? Well, it’s Boules, the popular French game in which you throw heavy metal balls down a strip of ground or lawn trying to finish closest to a jack, which is also known as a cochonnet or “piglet”. Apparently, it’s the heavy balls that are called boules, while the game itself is Petanque. Pronounced something like Pe-tonk. May I say that an afternoon spent playing Petanque with colleagues while drinking a glass of Pinot is a delightful way to bond? And the sound of clinking glasses and laughter from the lawn led to more and more players joining – and more and more bottles of pinot disappearing. Suddenly, it was one of the more popular pursuits of the afternoon. It so happened that I was idly looking through eBay on my return home when what should I find but a set of boules for sale not a suburb away from where I was about to visit. 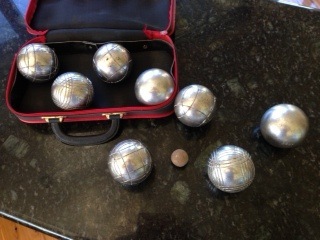 A set of boules for a starting price of $5.00. Yes, $5.00. However, as I started practising in earnest, one slight drawback to this new activity emerged. This entry was posted in Family, Friends and Home, Learn New Skills, Try Something Different and tagged Boules, Lancemore Hill, Petanque on November 19, 2013 by outsidethesquare101.